I always find it difficult to write about myself. What do people want to know about me? What can I say that’s interesting and won’t put them to sleep? But, I figure since I love reading about other people it’s only fair that I say a little something about myself too. Let’s start at the beginning…I was born in the 1970’s to two fantastic parents (and an equally fantastic older brother). We lived in a small town in Southern Ontario and I did the things that most kids do when growing up. My family was involved in the local theatre and soccer club and naturally I was involved too. I acquired my creativity from my Mom who is always involved in something artistic and I acquired my love of soccer from my Dad and big brother. I am still very active in soccer and hope my body will continue to let me get on the pitch for many more years to come. My husband and I have two boys (B and K) and are currently living in another small town in Eastern Ontario. The boys are always interested in what I’m making/crafting and are trying organized soccer for the first time this year. It’s fun to pass on your passions to your own children and watch them enjoy them as much as you do. I love to try new crafts and techniques and much to my husband’s dismay, for a short time I worked at Michael’s (the arts and crafts store). I don’t think I actually brought home much of a paycheck but, I did bring home lots of crafting paraphernalia, ideas and inspirations. I’ve played around with lots of things but the one thing that has kept my interest over the years is a fun little tool for burning wood. 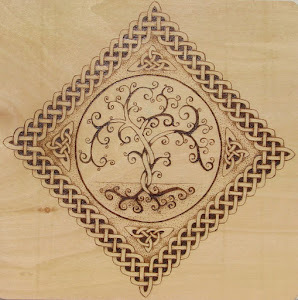 I experimented with it for a few years (and continue to experiment) and then reached a point where I felt confident to start my own business focused on wood burning. And that is why we are here, me trying to figure out what to write about myself and you, hopefully still awake, reading it. I snore. I’ve had to warn people before sharing rooms because apparently it’s that bad. I wouldn’t know, I sleep quite comfortably and don’t even know I’m doing it. When I was pregnant I snored so badly my husband had to sleep in another room, and I still kept him awake! When I was 18 I broke my nose playing soccer. It has been crooked ever since. I am pretty certain that this can be the only possible explanation for the snoring. I hate spiders. I’ve gotten better over the years (I don’t squeal quite as loud) but I still stop dead like a deer in the headlights when I see oneThankfully, I now have two more spider heroes to rescue me. My boys are very eager to use the bug zapper and fry any spider that’s made it into the house. Let that be a warning to all you spiders! I am super competitive. I really hate to lose. I’m so competitive I actually compete with people (sometimes complete strangers) without them even knowing. That way if I lose it doesn’t matter. I’ll even compete with people in exercise videos. It always puts a smile on my face if I can lift more or do more reps than the women showing me the exercise. Is this healthy?? I have a thing about feet. I really don’t like people touching mine. And I can’t stand seeing someone’s feet on a pillow, even if it isn’t my pillow. Feet are the sweatiest thing on our body and it gives me the creepy crawlies to see them touching something you put your face on. I also have a thing about hurting my hands and fingers. I couldn’t stand playing basketball, volleyball or baseball in school because I was afraid of breaking or spraining a finger. I’m such a girl, but hey, at least it wasn’t about breaking a nail! I have a grand illusion that I could have played professional soccer and/or for Canada’s Women’s National Soccer team. Unfortunately we’ll never know. Growing up in a small town the opportunities to meet the right people and coaches that could make that happen were missing. Oh well, I’ll just dream about how great I could have been instead. I collect pins. Strangely, it only occurred to me a short time ago that it was ok to indulge in a pin now and then. I crafted a neat frame to put them in so I can enjoy them all the time. Now every time I go to a new place I have to go to the gift shop to see if there is something interesting or appropriate that I can add to my collection. I LOVE sparkly, shiny things! I think I may have been a crow in a former life because my personality tends to lean more to the conservative side but deep down I love to see shiny, sparkly stickers, jewelry, nail polish, home accessories, and the list could go on forever. I usually only wear small hoop earrings and my wedding band even though I have three jewelry boxes full of fun jewelry. Sometimes I think it would be nice if we'd had a daughter and I could play dress-up with her. And remember to join me on Facebook!